Everything begins with an inquiry. Simply put a potential client contacting me regarding a planned event for available services and costs associated with the service. Each inquiry is listed as "New". This would be after an initial dialog between myself and a potential client. 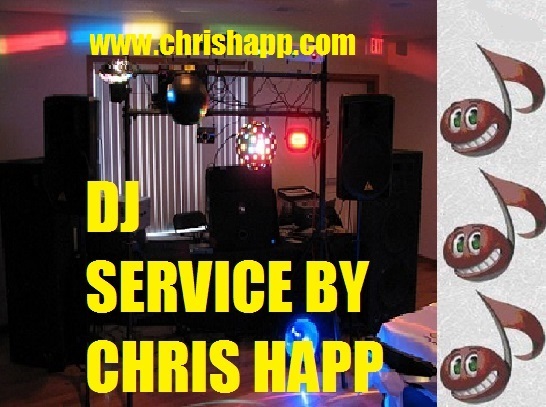 The client has indicated the intention of hiring Happy Productions DJ Service. It is listed as pending until the event contract is completed and the initial deposit is paid. The deposit "locks in" the date. Once the date is confirmed it no longer shows up as available to any other potential clients. For my past customers privacy I will only give out their contact information on a one by one basis. All of my previous customers have agreed to allow the contact by potential clients. Kelli - "Chris is very personable. He was very easy to work with. I think the DJ is very important to a wedding reception, they set the mood for the whole night. Chris worked with whatever I wanted. He understands how stressful a wedding can be and he worked so well with me, the DJ was not something I was stressed about!... Chris had a list ahead of time of the music I wanted and did not . He also played a great selection of music for all ages. Everyone was out on the dance floor!" Thanks again, Everything was awesome! You brought a great sounding system and the production went off without a hitch! You played a great selection of songs and you truly have great skills at reading a party and playing appropriate music selections. Happy Productions was a pleasure to work with, they always called and E-mailed back promptly. My wife and I would recommend you to anyone so feel free to give them us as a reference. A: Each price is set according to what is needed for each event. There is no set per hour charge. Additional services such as wedding ceremony service, multiple sound set ups will determine the final price quote. I no longer provide Karaoke. A: A signed contract that protects both the client and the DJ. A deposit that is part of the quoted package price not in addition to it. You MUST contact me prior to paying a deposit online to confirm availability. A: The quickest way to find out if I have a specific date available is enter the requested date on the "Availability" box on the DJ Service-Computer Service page. If I am available for your requested date the application will let you know and ask for contact information. if I am not available it will direct you to the WeDJ website to help you search for an available DJ.